New newsletters for the 2017-2018 school year coming soon! Join the Estabrook PMC Kids Ride team – Last Call! Ice Cream Night Volunteers: Thank You! As I am at the end of my two-year term as PTO president, I want to extend a sincere thank you to ALL OF YOU for making this year a great one! From your financial support via memberships to your willingness to come together and volunteer in roles big and small, you have made a huge difference. It means so much to the teachers, staff, and students to see all of us supporting the great things that they do every day. I would also like to thank the PTO Executive Board: Pauline Benninga, Jennifer dos Santos, Pei Ling Ferguson, Karen Griffiths, Katie Guilfoyle, Laurie Lanier, Linna Ma, Dana Moroze, Summer Parker, Diane Pursley, Olga Shaw, and Sara Sheikh. You put in countless hours behind the scenes, and were always willing to go above and beyond any time there was a need. Last, but certainly not least, I would like to thank the Estabrook faculty and staff. I am continuously amazed by the amount of care that you put into supporting Estabrook students and their families. Thanks in particular to Mr. LaBroad and Ms. O’Hare Gibson for the time and effort that you’ve put into our partnership this year. I am looking forward to seeing the amazing things that are sure to come at Estabrook in 2017-2018! Each grade level attends two Arts Created Together performances throughout the school year. This year students enjoyed Chinese acrobatics, Kathak dancing, a spinning wheel demonstration, an Egyptian-American dancer and musician, hip hop dance, American folk music, a lesson on writing historical fiction, and an improv anti-bullying workshop. Each grade receives science enrichment from the PTO. Some highlights include chick hatching, ponding, a visit from the Museum of Science to learn about weather and the water cycle, Science Fair, and our very first Maker Night! The library received over $2,000 for the purchase of books and other materials over the course of the school year. This year, the PTO provided over $8,000 in support to our teachers and staff. We supported several grants, including Colonial Craft Day for third grade, and a reading software subscription for the Special Education team, in addition to funding teacher stipends and professional development. We had a great year and are looking forward to continuing to provide so many wondeful events and programs for the Estabrook community next year! 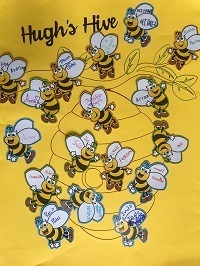 Last call to join Estabrook’s PMC Kids ride team “Hugh’s Hive”! The third annual Lexington Pan-Mass Challenge (PMC) Kids Ride is already more than 70% full and we are excited that Estabrook School is well represented with 43 riders to date. Please act soon if your child wants to be a part of the team! To register to ride with “Hugh’s Hive”, click here: http://www.kids.pmc.org/lexington.aspx Click the orange REGISTER button and on the TEAM REGISTRATION OPTIONS page, make sure to choose ESTABROOK SCHOOL. Thank you so much to all the families who braved the rain and came out for Ice Cream Night. We had a blast! We also want to thank the volunteers who helped to make the evening a success: Kadambari Colaco, Krista Cunningham, Sara Cuthbertson, Jon Finegold, Katie Fletcher, Laurie Lanier, Linda Mintz, Manisha Patel, Olga Shaw, and Yumio Saneyoshi. Thank you, too, to our custodial staff, Steve and Olga, for all their hard work! You can sign-up until the end of July! Go to the dropdown menu “how did you hear about us” and select Estabrook School. The Town of Lexington has been chosen for a challenge grant from National Grid and can win up to $45,000 dollars for the Town by helping residents save money and become more energy efficient. For each Home Energy Audit, and follow up energy saving measures, the Town will earn money towards our goal. HomeWorks has offered to donate $15 to Estabrook School for each home energy audit completed by a household. You just have to go to the drop down menu on the HomeWorks sign up form on line, or mention Estabrook when contacting them by phone. No-cost energy-efficient LED light bulbs, power strips, programmable thermostats, & water-saving measures on qualified fixtures. A health & safety check testing for toxic substances & fire hazards & evaluating the heating system. Events held in our community will be advertised on their own special page on our website. Click here to find out more!